The first one on this list is Arya Stark played by Maisie Williams, who got successful in escaping the death, but she was just about to die in the previous episode, The Broken Man. She just got lucky. It may not happen in the future. 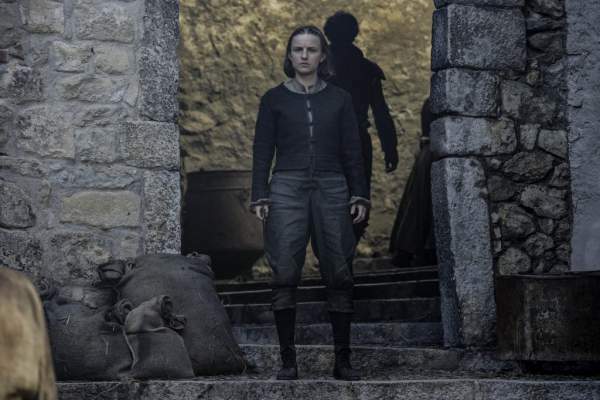 The upcoming episode eight is titled ‘No One’ and it is quite clear that Arya will have to go through a test. It will be interesting to see if the result of this trial will have an impact on Arya’s decision to leave Braavos or not. Some fan theories suggest that the showrunners have only dragged her death from the previous episode to get the wicked fun. In the meantime, Arya’s elder sister Sansa (Sophie Turner) with her brother Jon Snow (Kit Harrington) is not leaving any stone unturned to gather a large army to take back Winterfell from Ramsay Bolton (Iwan Rheon) and also to save their younger brother Rickon (Art Parkinson). Moreover, the next episode will witness Sansa’s knight Brienne (Gwendoline Christie) getting back to her old friend Jaime Lannister (Nikolaj Coster-Waldau). On one hand Brienne is bound by her honor and on the contrary, Jaime is bound by his love for Cersei (Lena Headey). Thus, Jaime tells Brienne that if has to kill every single person to get back with Cersei, he would exactly do the same. Back in Kings Landing, Cersei is preparing herself for a war against High Sparrow (Jonathan Pryce). She believes that she alone is not sufficient to destroy the religious militant. However, without her knowledge, Margaery (Natalie Dormer) is also planning the same. Watch Game of Thrones season 6 episode 8 online as it airs at 9 pm ET on Sunday in the USA on June 12 on HBO. It will be available on SkySports in the UK next morning. While in India, Hotstar will air it at 7:30 am on Monday, 13th June. Also, it will air on Star World Premiere at 10 pm on Tuesday. A spoiler post on Reddit suggest that episode 9 and 10 are titled, Battle Of The Bastards and The Winds Of Winter respectively will see some shocking deaths. Stay tuned to The Reporter Times for latest Game of Thrones news and other Entertainment updates. Don’t forget to share in on social media sites like Facebook, Twitter, Google Plus and others to let other fans also know. Share your thoughts and views.